Now that the holidays are over you may need some color inspiration for your next projects. 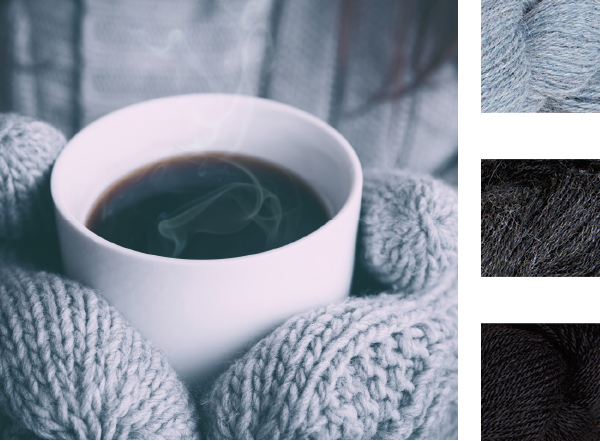 Here are some beautiful winter photos that are paired beautifully with our Knit Picks yarn lines. If you have a great project in mind but are stumped on what colors to use, I suggest you try a few of these beautiful winter color palettes out. New Yarn Line – Dapple! Dapple is our newest yarn and it's a cushy, cozy delight. Filling a gap in our Super Bulky selection, it's the only yarn Merino yarn we carry in that weight, and also adds a novel spray effect to the solids that make up most of the yarns in that weight. Make that wool Superwash for added convenience, and you've got a yarn that fills all the right niches for something you'll really want to get your hands on. Literally. It feels amazing. Luxury Yarn Sale, Save up to 40% off! Over 500 of our most elegant yarns are currently on sale! Now through January 2nd you can find silk, cashmere, alpaca, and mohair all on sale and ready to be lovingly crafted into beautiful, stylish designs. From our regular radiant dyes, and handpainted colors, to the limitless potential of an undyed bare, our luxury yarns come in a dynamic range of colors helps you to realize your project's most deluxe potential. With the recent additions to Knit Picks line up of traditional, undyed yarns, Simply Wool and Simply Alpaca, we've been thinking a lot about knitting days long past. These quintessential yarns demand classic techniques, so first Hannah and Daniel talk about their experiments with them and share some ideas for how to really make them shine. After that, Stacey and Alexis bridge those yarns of yesteryear with today's traditions, contemplating knitting superstitions and sharing fiber beliefs old and new. Give a hand-knit gift – there’s still time! Spread the handmade love around this holiday with these quick and easy hand-knit gift ideas! Here are a few patterns that can be easily knitted in a weekend, afternoon, or even an hour. The staff at Knit Picks loves the holidays because we get to share all our crafty expertise with friends and family from baking treats to knitting with steeks. We also know that ambition can get the best of us, therefore, this year we designed for our gift giving-loving customers a menagerie of Ready to Wrap Gifts!